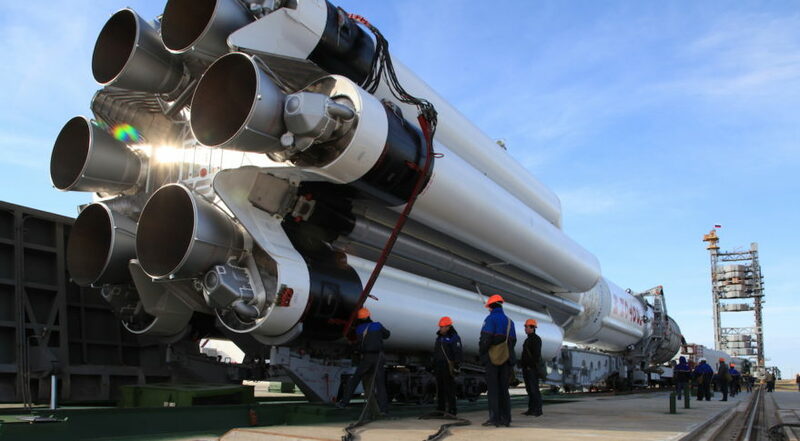 WASHINGTON — International Launch Services, the commercial sales division of Russia’s Proton rocket manufacturer Khrunichev, is now part of Glavkosmos, a Roscosmos subsidiary that sells Soyuz rocket launches. Reston, Virginia-based ILS, which has struggled to sell Proton launches against a backdrop of past vehicle failures and increased competition in the U.S., Europe and Asia, will serve as the “North American marketing unit for Glavkosmos” for selling Russian launch services, ILS said April 12. Proton averaged around nine launches a year from 2008 to 2018, but last year launched only twice, neither of which was an ILS mission. This year ILS has only one mission planned — a Proton dual launch carrying the Eutelsat 5 West B communications satellite and Northrop Grumman’s first satellite servicing spacecraft, the Mission Extension Vehicle 1. Khrunichev said in March that a minimum of six Proton launches are planned for this year, the majority being Russian government missions. Soyuz, in contrast, has enjoyed a larger share of the commercial market thanks to Glavkosmos and European launch provider Arianespace, the latter of which launched four Europeanized Soyuz rockets in under five months from French Guiana, and has 20 more Soyuz launches on order for megaconstellation company OneWeb. Arianespace plans to phase out Soyuz in the coming years with Europe’s next generation Ariane 6 and Vega C launchers, both set to debut in 2020. ILS spokeswoman Lisa Miller did not immediately respond to a request for comment. Pavel Luzin, an international relations expert in Russian space policy, said the combination of ILS and Glavkosmos is part of a larger space sector reorganization by Roscosmos that could give Russian space vehicles a better chance at winning U.S. business. Dmitry Loskutov, Glavkosmos general director, said the combined company will benefit from more tightly integrated launch services. “This is part of our industry’s path back to being a major contributor in global commercial space launch,” he said in a statement. Pysher said the combined company will be able to offer backup agreements, since it will have access to both Proton and Soyuz. Under the umbrella of Glavkosmos, GK Launch Services will market commercial Soyuz-2 launches, while ILS markets commercial Proton launches. In an interview following the late December semi-commercial launch of a Soyuz 2 rocket from Russia’s new Vostochny Cosmodrome, Lyudmila Savelyeva, GK Launch Service’s marketing chief, told SpaceNews the company wants to convey a new image of Russian space. At the end of 2018,the company had 35 employees, mostly marketing, sales and project management specialists. They promise end-to-end services for commercial Soyuz 2 missions. And that marketing savvy is being used to double down on Soyuz. Flashy graphics and charts distributed by the company highlight the rocket’s history, reliability and versatility. They are trying to relaunch the brand: rather than something old and outdated, GK Launch Services wants to present Soyuz as something with history and a track record.